These are the basic requirements for an energy conserving or solar heated greenhouse. Even if you have a conventionally heated greenhouse, you can still reduce the need for heat and reduce your heating bills by applying some of these basics for higher energy efficiency. 1. Insulated walls. If you have a freestanding greenhouse, can you insulate the north wall? If you live in a sunny area, you may also consider insulating the east and/or west walls. Start with the side receiving the winter prevailing winds. Some people retrofit an existing greenhouse for winter by using a foil backed “bubble wrap” type of material on the north, east and west walls and north portion of the roof. This material is commonly sold as “Reflectix” insulation. 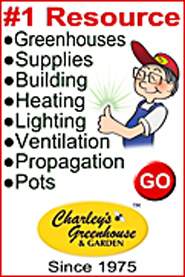 It is found in lumber yards, hardware stores and sold by greenhouse supply catalogs. For even more insulating ability you can double-up this material. 2. Insulated foundation. The foundation of your greenhouse should not be a heat sink. If the ground is freezing cold outside, then it will conduct directly through your foundation making it cold inside. The solution is to insulate your foundation’s outside perimeter with Styrofoam board, usually 1 to 2 inches (2.5-5 cm) thick. This insulation should be placed vertically and extend down to a minimum of 1 foot (.3 m) in most temperate areas. If you live in gardening zone 4 or less (as determined by the USDA garden zone map), consider even deeper foundation insulation. Set the foam-board insulation against the outside of your greenhouse foundation. 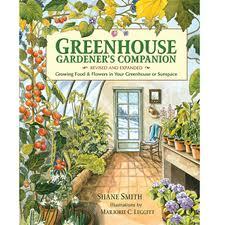 What if your greenhouse has no foundation? 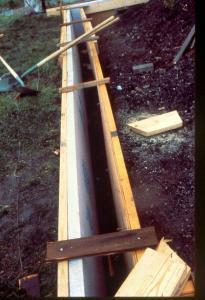 Place the vertical insulation in a trench around your greenhouse perimeter. 4. Seal every nook and cranny prior to winter’s arrival. Vents and doors must be weather-stripped, and cracks must be caulked and checked for wear every year. 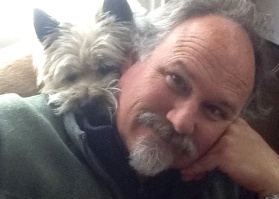 I usually do an inspection for any potential air leaks in fall before the cold weather comes. I always find an area that needs some sealing up. A good way to search and destroy winter air leaks is to close up the greenhouse and light up some incense (If you are a Buddhist or were around during the 60’s, you might even have some around the house). Light the incense and hold it near suspected leaking areas. You can visually see the smoke respond to incoming air currents as you move the incense around. If the smoke streams in a new direction, there is your leak. Plug it up with caulk, foam, weather-stripping, or whatever is appropriate for the spot. Improvise if you must. One small air leak can make the difference between above and below freezing! 5. Thermal storage. This is the use of rock, water or other dense thermal mass material in which to store the incoming solar heat. Water is by far the most efficient and easiest material to use (cheap too!). Solar greenhouses are notorious for their accumulations of black 55-gallon (208-liter) oil drums filled with water placed along the north wall to store the sun’s heat. They are cheap and efficient. For smaller greenhouses look for the 30-gallon metal drums. Many owners of heated greenhouses have also installed containers of water to increase heating efficiency. It’s easy to use a water drum as a support for a plant or soil table. 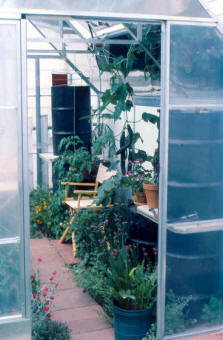 The image shows some of the basics of a passive solar heated greenhouse (in this case, the Cheyenne Botanic Gardens). Notice the different sun angles between summer and winter, and the associated results when the greenhouse is constructed properly for maximum heating and cooling effects. 6. Air-lock entry. If you have a free-standing greenhouse or if you use your attached greenhouse’s exterior door with any frequency in wintertime, you should consider installing a second door that creates an air-lock entry. This is a two-door setup with enough space between them so that when you open the outside door, you won’t get a blast of freezing air onto your poor little plants. Even if you heat your greenhouse conventionally, an air lock entry will save an immense amount of energy. For freestanding solar greenhouses, an air-lock entry is essential equipment. Attached greenhouses owners can get away without one as long as you always go through the house! Never use the outside door when it’s cold. 7. Site orientation. If you have a solar greenhouse, you had better hope it’s oriented in the correct direction. If it’s not, I guess that there isn’t much you can do about it now. 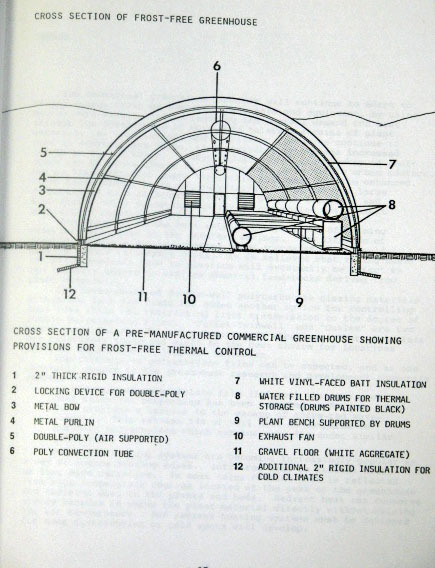 A solar greenhouse should face within 20° either side of true south. 8. Night curtain. This is an option for people in very cold areas. It is not for everyone. A night curtain is usually an insulating cover you roll across the inside of the greenhouse glazing at night like a blanket to prevent excess heat loss. I often view night curtains with a bit of skepticism. One problem is that they are costly and often have problems with reliability and are not easy to find off the shelf. Homemade ones are even less reliable. The farther north you live, the more they may make sense. An alternative could instead be the addition of an extra layer of glazing. If you have single glazing, consider double. If you have double glazing consider making it three layers thick. This can be achieved by either re-skinning your structure (that’s not what you want to hear, huh). A cheaper alternative is to apply a new inner layer of vinyl, or polyethylene film. Read a few paragraphs prior (Double or triple glazing) about using plastic bubble packing. By the way, a light evening snow on the glazing is a great nighttime insulator and is free. Always wait until morning to knock the snow off unless you have concerns about the weight of the snow on your greenhouse structure. The image below was part of a publication Shane Smith first did for the Department of Energy – Western Sun division in 1982. It described the first proposed retrofitting of a commercial Quonset greenhouses that use zero energy and remain frost-free. These are now often called “High Tunnels,” or walk-in cold frames.